For almost 40 years he has appeared in top showrooms in Atlantic City, Reno, Lake Tahoe and Las Vegas. He is regarded among the world’s top entertainers. Rickles is also highly visible on TV, as well as in motion pictures, including appearances in Universal Pictures’ “Casino,” directed by Martin Scorsese, appearing with Robert De Niro, Sharon Stone and Joe Pesci, “Toy Story,” a revolutionary computer animated feature, for Walt Disney Pictures, and the now cult classic, “Kelly’s Heroes,” as well as early career roles in “Run Silent, Run Deep” and “Rat Race.” He is also seen in the mega-hit “Toy Story 2.” Additionally, he has starred in live stage productions and, along the way, has had two best-selling comedy albums. In 1959, Rickles signed for his first Las Vegas appearance. He clicked immediately and has headlined there every year since. In the mid ‘60’s, even though he had attained some success in nightclubs, Rickles was still far from a national name. He had been working in clubs, and doing television and motion picture acting assignments for more than 15 years. Although it is difficult to pinpoint the exact moment of his breakthrough, Rickles believes the ball really started rolling on the night of October 7, 1965, during his first appearance on Johnny Carson’s “Tonight Show.” His freewheeling performance that night became the talk of the showbusiness industry and caused nationwide comment among the press and public. Until then, Rickles’ TV appearances had been limited to acting assignments on situation comedy and dramatic shows. A fine actor who graduated from the American Academy of Dramatic Arts in New York, Rickles had frequently received rave reviews for his acting ability. But now, the door was wide open for im to appear on TV as a comedian. The next important breakthrough for Rickles occurred during the summer of 1967. He was signed to appear on “The Dean Martin Show.” Rickles, in his first guest appearance on a major prime-time variety show, scored a major success. Meanwhile, the public was discovering that behind the sharp Rickles’ barbs was deep affection and love for those whom he seemed to be taunting. “If I were to insult people and mean it, that wouldn’t be funny,” Rickles told an interviewer. “There is a difference between an actual insult and just having fun.” By year’s end all three major networks and every major independent producer were besieging Rickles with ideas for a TV series of his own. He has since starred in prime time series for ABC, CBS, NBC and FOX. During the ‘70’s and ‘80’s, Rickles also hosted or co-hosted seven television specials. In 1980, his star became even brighter internationally when he became the toast of British society as a result of an appearance at Grosvenor House in London during a fund-raising gala. The guest of honor was Princess Margaret, who laughed heartily at Rickles’ barbs directed at her, as did many other British theatrical, political and social leaders when it came their turn to be zinged. Afterwards, the Princess invited Rickles and his wife to her table so that they could become better acquainted. The British press for days afterwards headlined what Rickles said and did. Offers to make concert appearances in that land have since been pouring in. Another TV appearance of note came in 1984 when Rickles received one of the highest honors an entertainer can be afforded. He was invited by President Reagan to perform at the televised Inaugural Gala, where he “zinged” the President, the Vice President and other of the nation’s dignitaries gathered for the occasion. Don Rickles was born in New York City. As a teenager, he performed in high school plays and at neighborhood dances before starting to work in small nightclubs. His “insult” style just happened. Two years after his discharge from the U.S. Navy in 1946, he was working in nightclubs. Never a great joke teller in the traditional sense, Rickles suddenly found himself talking directly to the audience and throwing “off the cuff” lines at them. The laughs came and the rest, as they say, is history. Rickles is also well known for his many charitable involvements. Among his proudest moments was the dedication on February 7, 1982 of the Barbara and Don Rickles Gymnasium at Sinai Temple in West Los Angeles, California. The gymnasium was built with funds raised by Rickles and many of his star friends during a special performance at the Ahmanson Theater in the Los Angeles Music Center. Rickles and his wife Barbara live in the Los Angeles area. They have a daughter Mindy, a son Lawrence, and recently became grandparents for the first time. Do you want to hire Don Rickles? Directly request a quote. In 48 hours we can send you the availability of Don Rickles If you would like to book Don Rickles, Entertainment Booking Agency is the right place. 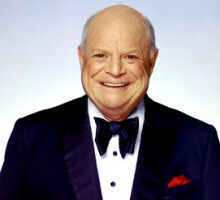 We will offer you the best price and contact the management or we directly contact Don Rickles. For corporate appearances or speaking engagements you can contact our agents and the will help you true the process. Tags: hire Don Rickles, Don Rickles booking, book Don Rickles, Don Rickles appearances, find more information on booking Don Rickles for appearances, Don Rickles speaking engagements, Don Rickles endorsements/spokesperson, Don Rickles appearance fees, Don Rickles booking agency contact info, biography of Don Rickles, Contact an artist booking talent agent find a speakers bureau that can book Don Rickles, speaker booking agency for Don Rickles, Don Rickles booking agency, Don Rickles booking for corporate event. EBA is one of the biggest entertainment booking agencies in the World. We book hundreds of celebrities, artist, athletes and speakers in a year. Important to know is that we are not claiming to be the management of Don Rickles. We are not the official agent for Don Rickles. Companies from around the globe book these artists and speakers true our company be course we have one of the biggest networks and we always have direct contact with the artist or the management. We help you to find the right celebrities for your corporate of private events. Please contact one of our agents to get free advice and we will help to get the world-famous artist on your party.